This unique methodology, developed over and during 12 years working with nearly 200 intranets, takes into account the best practices of the World's best intranets, and some of the very worst. It is a unique methodology developed specifically for intranets, though equally applicable to websites, and social intranets -- because a social intranet has the same needs, requirements, and end employee users as a traditional intranet with the only difference being 'social' capabilities. 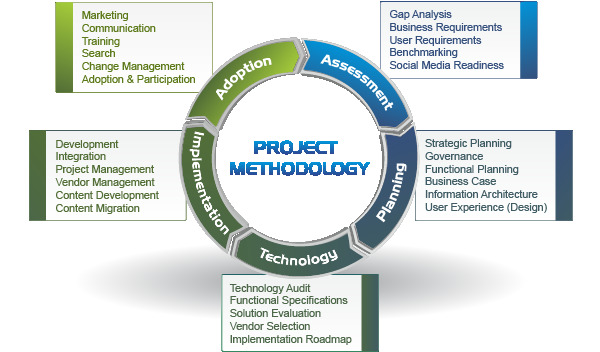 The Social Intranet Methodology includes all activities to begin planning, designing, and constructing and implementing a social intranet solution – including assessment or evaluation activities (sometimes referred to as 'discovery') as well as all of the planning activities ranging from the high-level strategic plans, to the detailed tactical requisites such as the site wireframes and information architecture. Prescient Digital Media does not use a proprietary technology for building or constructing client intranet sites or intranet portals. We are ‘technology neutral’ which means that we will work with you to identify the appropriate technology solution based on your business requirements, and not "who we know" or based on reselling agreements and commissions. Though we have years of deep experience working with SharePoint and other commercial and open source products, we do not represent nor sell any product. In identifying the best solution for your organization we manage all aspects of the vendor process including the evaluation and selection of the vendor, negotiate technology licenses and fees, project manage the implementation, and even manage and execute ongoing site operations including custom content development and translation services. The output of these phases constitutes the Intranet Blueprint for guiding the implementation of the intranet or portal and the underlying governance and technology foundation. The Intranet Blueprint contains the map or blueprint for implementing a new social intranet or enterprise portal. Finally, the Intranet Blueprint serves as the basis for evolving your site, establishing baseline targets (e.g. user satisfaction, ROI, etc.) for measuring its ongoing and future performance, and achieving its potential and value.